Kharkiv Ukrainian Drama Theater ( Kharkivskyi ukrainskyi dramatychnyi teatr im. T. Shevchenka). A national theater founded in 1935 out of remnants of the suppressed Berezil theater as an explicit negation of the latter. 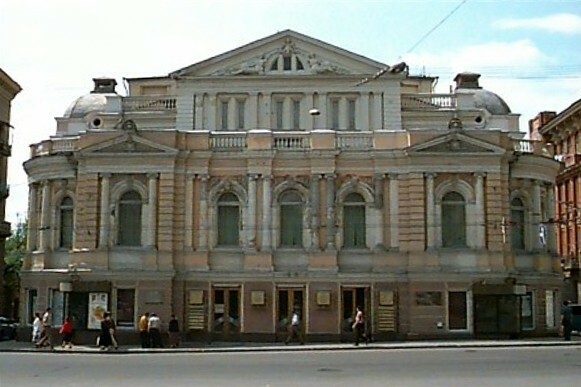 The chief features of the new theater's policy were the adoption of socialist realism, a preference for Russian Soviet plays in its repertoire, an imitation of the Kyiv Ukrainian Drama Theater, a predilection for Oleksander Korniichuk among Ukrainian playwrights, and the restriction of its Western European repertoire to 19th-century classics. By decree of the People's Commissariat of Education, Mariian Krushelnytsky was appointed director of the Berezil theater in October 1933 and retained this position in the new theater until 1952. He was succeeded by B. Nord (1952–7), a product of the Moscow Artistic Academic Theater, Oleksander Serdiuk (1957–62), and Volodymyr Krainychenko (1962–4). Thereafter, the theater gradually regressed to a repertoire of contemporary socialist-realist plays, populist-realist classics, and increasingly frequent guest performances staged by Russian directors of Konstantin Stanislavsky's school. The theater's stage directors included Hryhorii Kononenko (1965–9), a postwar graduate of the Kharkiv Institute of Arts, Volodymyr Ohloblyn (1967–71), of the Moscow school, and later B. Meshkis (1971–4), Anatolii Litko (1974–9), and O. Bieliatsky. Among the more memorable plays produced by the company after the war were Vasyl Mynko's Ne nazyvaiuchy prizvyshch (Without Naming Names), Henrik Ibsen's Ghosts, William Shakespeare's Hamlet (1956), Oleksii Kolomiiets's Planeta Speranta (Planet Speranta, 1966), Ivan Kavaleridze's Perekop, Mykola Kulish's Patetychna sonata (The Sonata Pathétique, 1972), and Shakespeare's Richard III (1976). The theater's stage designers included Vadym Meller, Vasyl Hrechenko, Dmytro Vlasiuk, H. Batii, O. Kostiuchenko, V. Kravets, and T. Medvid. Besides the former Berezil actors (Amvrosii Buchma, Danylo Antonovych, Ivan Marianenko, Leontii Dubovyk, Yevhen Bondarenko, Nataliia Uzhvii, Sofiia Fedortseva, and Valentyna Chystiakova), the company included such actors as Lidiia Krynytska, N. Herasymova, N. Lykho, R. Kolosova, S. Chybisova, Liubov Popova, O. Svystunova, L. Bykov, Anatolii Litko, Viktor Shestopalov, Volodymyr Maliar, A. Dzvonarchuk, Viktor Ivchenko, and Leonid Tarabarynov.